Preheat oven to 400 degrees. Season chicken wings with Slap Ya Mama Original Blend Seasoning to taste. Arrange wings on a cooling rack that can be placed inside a baking sheet. If you don’t have a cooling rack, simply place the wings on the baking sheet. Bake for 30 minutes. While the wings are baking, you can make the wing sauce. In a medium saucepan over medium-low heat, combine butter, honey, Slap Ya Mama Pepper Sauce and Slap Ya Mama Hot Blend Seasoning. Mix well and simmer about 10 minutes. 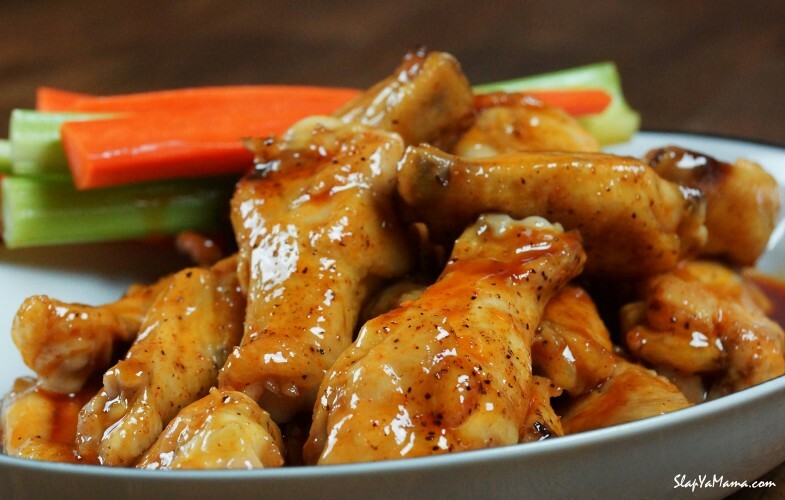 Place baked wings in a large bowl, pour sauce over wings and mix well, coating the wings with sauce. Serve with carrots and celery stalks and enjoy!